If you love pickles, this is your weekend! 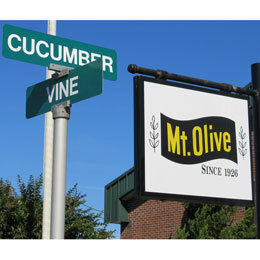 Mount Olive, NC is the unofficial “Pickle Capital of the World”, complete with a Pickle Drop on New Years’ Eve and a Pickle Festival in Spring. It is taking place this weekend, and if you’re longing for a present-day Mayberry Town Fair, this is the place to be. There is live music, there are dance performances. There is food (not just pickles), there are craft vendors. For “little girls (any age) and their very special guest” there is the “Pickle Me Pink Tea Party“, a “dill-ightful occasion” for $25/couple. 2p-4p, tickets required. For the less pink inclined, there is the Antique Car Show taking place on Saturday as well. Finally, don’t forget to bring a can of food for their food drive – Mt. Olive brand or other! The picture of Cucumber and Vine is © Debbie Craft, used with permission. This entry was posted in Food, History, Machines, Music, Outdoors by daddyweekly. Bookmark the permalink.